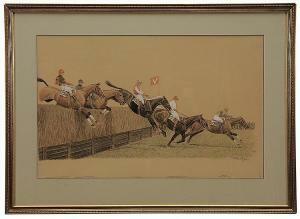 Find artworks, auction results, sale prices and pictures of Paul Brown at auctions worldwide. each, plate: 10 by 23 in. Published and Copyrighted by The Derrydale Press, New York in 1937. Born in Mapleton, Minnesota, in 1893, Paul Brown soon moved to New York City with his family. At the age of 17, his family relocated again to Garden City on Long Island, where Brown had the opportunity to explore polo grounds, including Meadowbrook Polo Club, and horse shows such as Piping Rock. Fellow artist and close friend Milton Weiler (1910-1974) also lived in Garden City, where he headed the art department of the high school. Though Brown had little formal art training, he spent extensive amounts of time sketching, observing, and studying horses in motion and at rest. Upon graduating high school, Brown supported himself as an advertising and periodical illustrator, thus beginning his artistic career. 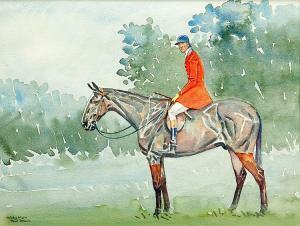 Brown created fashion and sporting illustrations for Brooks Brothers, including equestrian scenes. 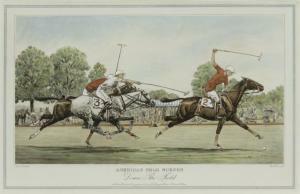 He was very involved with "Polo" magazine, helping to launch it in 1927 and serving on its editorial board. One of Brown's horses graced the cover of "Time" magazine in March 1929, and in 1930 he was asked to produce a series of hand-colored aquatints of field sports such as steeplechasing and foxhunting for Eugene V. Connett III's Derrydale Press. Brown introduced Weiler to Connett, and Weiler went on to illustrate four books himself for Derrydale. In 1959, when Brown passed away, Weiler helped Paul's wife Sallie organize his estate. The friendship between the two artists is reflected in the inscribed books given from Brown to Weiler, sketch pad pages, and some fine paintings, including a large picture which was prominently displayed in the holiday window display of Brooks Brothers in New York City. As an artist, Brown was known for his quick and confident style as well as his spare use of color and occasional use of tinted paper. He was partial to pencil on paper and his simple lines convey his authority on the anatomy and behavior of horses. 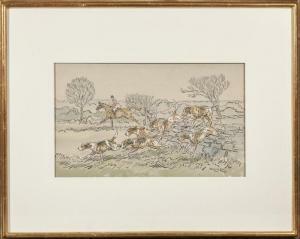 Recognized as one of the most accurate equestrian artists of his day, Brown's drawings, watercolors, and illustrations inspire collectors and horse lovers alike. watercolor, 8 3/4 by 11 5/8 in. watercolor, ink, and gouache, 9 1/2 by 16 in. watercolor, ink, and gouache, 10 by 16 in.